The Service Project portion of the Women's Conference allows the women to participate in a meaningful contribution of time, energy and talents to serve the Asia Area. The project should benefit people within the Asia Area who have a need that can be met, and allows the women to unite for a good cause during their time together. There are two, two hour blocks of time allotted the Service Project, open to all women attending the Conference. This portion of the Conference allows an opportunity not just for the women to learn about becoming more like Christ, but to go to work doing good works as He did. 1 YEAR BEFORE: Confirm service project for coming year at the close of the Conference each year. - Prepare multimedia presentation of previous year's distribution/service project impact to share during the Conference (short slideshow, 2-4 minutes) (applicable for DFG distribution which is made after the Conference concludes). - Review https://www.asiawomensconference.org/service.html and send needed updates to the Website Administrator. - Set up the Service Project room with committee volunteers. - Arrange for repairman to come service all sewing/serger machines so that they are functioning properly. How did conference go this year? I'm sure it was another fabulous success with you at the helm! Will your same service project leader be heading up next year's conference activity? I was too late to really follow up with the Cambodia help (with my neighbor) for this year's conference, but this project would be a great help and the kits could be sent to women anywhere - Cambodia, Thailand - so many places in the Asia Area. My neighbor here said that the women sit on cardboard boxes after they give birth, until they are done bleeding. Hard to imagine, right? I'm heading to a presentation this Thursday night in Orem to learn more about the program. I'm terribly sorry that I haven't written earlier with a little wrap on the service project. I'm sure you and Debby have debriefed more, but I thought I would add in my two cents. Mostly, just ideas for moving forward for next year. I'm excited that I'll get the chance to be involved again. I learned a lot this year, mostly from working with the amazing Debby and the entire conference committee. It was a real pleasure. Thank you so much for all your hard work and diligence in preparing for this conference each year. It is a labor of love and we feel that love from working with you. Thank you! I'm going to put bold headers on each of the things that I thought contributed to the overall success and then talk about ways that I think we could improve upon that area or recreate it for next year. I think we were really ambitious with the service project this year and that ambition paid off big time! The women who participated were engaged and motivated and inspired by the service project in a way that I wasn't anticipating. It was humbling and wonderful to see. I think I would like to be more in communication with the women about the project in the months leading up to the conference, ie posting more regularly on Facebook, adding information to the website earlier. I'd also love to get some of the videos/materials from Days for Girls to post online as well. This leads into another area where I think we experienced success, but could improve, Pre-conference work. I think that the pre-conference work was amazing. It helped so much to get the ball rolling and to have women engaged and excited for the project before arriving. I really want to continue this in 2017. I don't want to micro manage it too much, but I think we could have managed it better, ie invite women to participate earlier. Send more clear and specific instructions, better method/policy for reimbursement and intake of the work. I loved the training that Celeste did on both Friday night and Saturday afternoon. I didn't get a complete count of how many attended. Did you happen to attend either of those trainings? I just peaked into the chapel on Saturday afternoon and saw about 30 women participating in the training. I would love to do that again next year. We would have to talk to Celeste DfG about whether someone else could run it as I imagine that Celeste would not come back again next year. Maybe Julie Cook? It was amazing to see how many women were eager and excited to participate. I don't know if we have ever had that many women stay beyond the appointed hours to work on the project. I loved that! I think because we were ambitious and there was still a lot of work to do, the women saw a need and filled it. It was great! I think we did a good job having lots for the women to do, even for us non-sewers, there was plenty of work, cutting, tracing, hand sewing...there was something for everyone. I liked having station leaders at each of the stations and breaking the work up into manageable chunks (ie one person doesn't complete one shield, liner or bag). I want to reach out to recruit team leaders earlier and make sure we can have a more concrete conversation before the event (we tried, but technology failed us). I met today with Elder and Sister Nielson and Patrick Cheuk from the Asia Area office to discuss our funding proposal for the Days for Girls Service Project. They gave us the go ahead and just requested a few things. 2. Make sure we take a lot of picture of the sisters doing the service project and when the kits are distributed. 3. If possible gather anecdotal stories of the distribution of the kits i.e. : how the kits helped the women who received them. 4. There is also a push to distribute service items to places that are at maximum 1 hour away from an LDS meeting house. Initially, they said a maximum of 1 hour away from the LDS meeting house where they were created, but we discussed that since our conference involves women from all over the area, that as long as it is an hour away from the LDS meeting house within the Asia Area (of the church), it would be okay. It relates to the Centre of Strength policies that have been developed from SLC. When we submit our final report, they want to have a firm destination of where they kits will be distributed. Ideally, the kits will be distributed before the final report is submitted, but I don't think that is realistic. So, we will submit the receipts, an initial report of what went on during the conference (i.e. 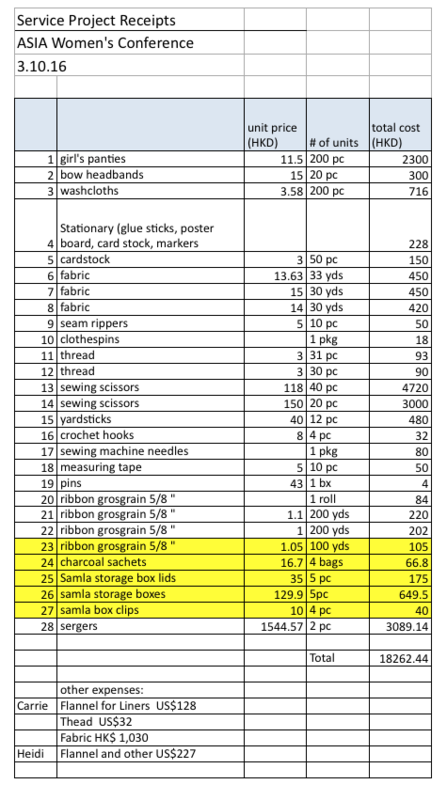 how many kits we made, where and when we intend to distribute them) so that we can get reimbursed. Then, we will add an addendum to the report after the kits are distributed about the distribution process.